Degree/ Marriage/ Birth Certificate attestation for Dubai, Abu Dhabi, Sharjah(UAE) from Mumbai, Pune, Kolhapur, Ahmedabad and Surat. ﻿Degree/ Marriage/ Birth Certificate attestation for UAE from Mumbai, Pune, Nagpur, Nashik, Solapur, Kolhapur, Ahmedabad, Surat and Valsad. 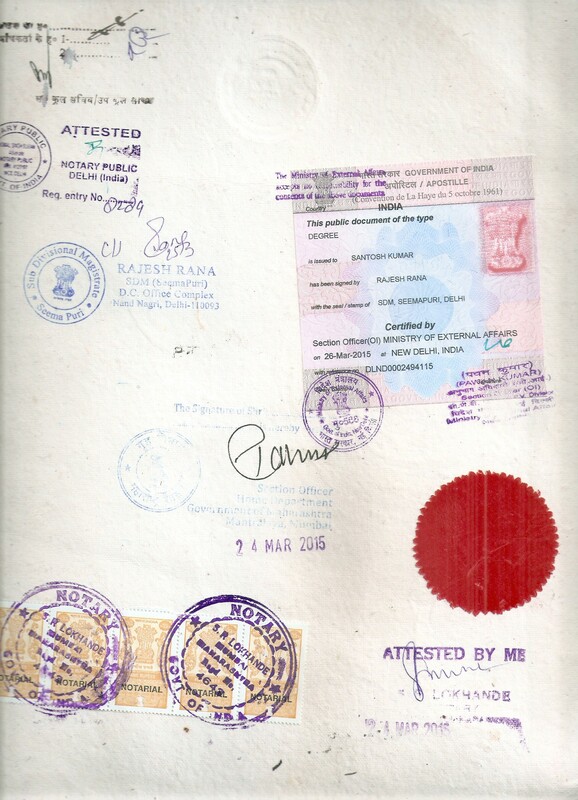 Certificate Attestation from HRD,Home Department, MEA Attestation .The Government of UAE requires all educational/Personal certificates, professional or academic, issued from India to be attested from Embassy/Consulate in India. 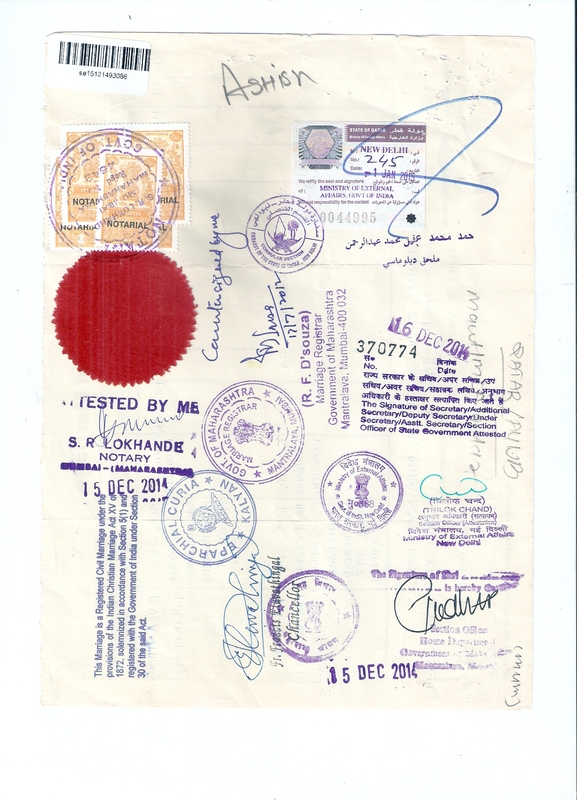 Certificates needs to be get attested for UAE (Abu Dhabi, Dubai, Sharjah) formal purpose. First the Notary will be done. After getting attestation from notary you can submit the certificates for home department attestation. MEA attestation is under the ministry of external affairs govt. of India. Ministry of External Affairs should attest all the certificates issued in any state in India before submitting to UAE Embassy. Education department attestation or home department attestation should done for the MEA attestation. MEA attests all educational certificate non education certificates and commercial certificates. Certificate Attestation from HRD, MEA Attestation .The Government of UAE requires all educational/Personal certificates, professional or academic, issued from India to be attested from Embassy/Consulate of UAE to grant of UAE Employment Visa or Family Visa. 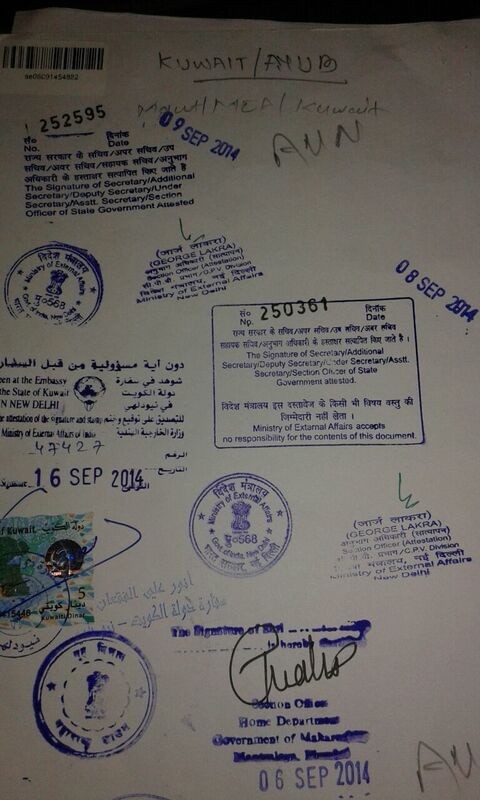 After getting successful attestation from MEA we will submit the certificates to UAE Embassy for attestation.. The embassy will attest all educational and non educational and commercial document if the certificate already attested by MEA. 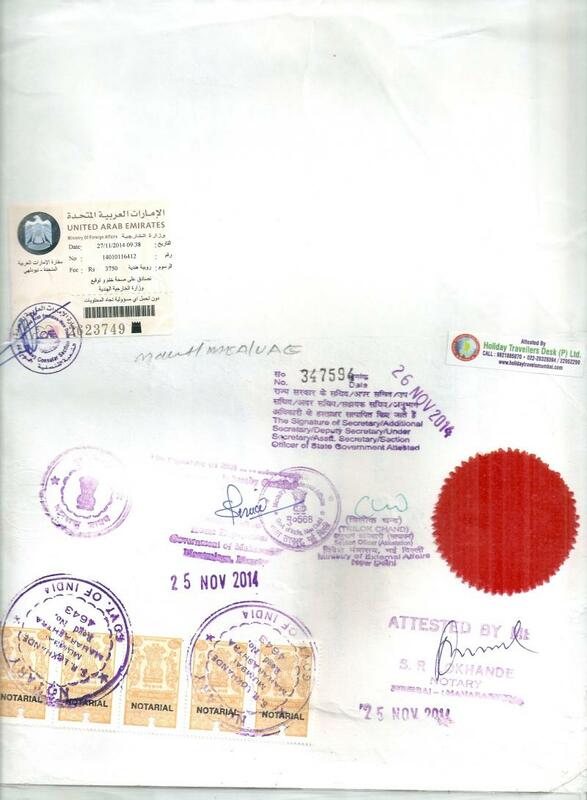 We attest below mentioned Certificates for UAE Embassy attestation. Degree Certificate/ Birth Certificate/ Marriage Certificate attestation for UAE in Rajkot, Patan, Jamnagar, Amreli, Porbandar, Junaghad, Gandhinagar, Vadodara, Bharuch, Narmada, Surat, Navsari, Dangs, Valsad, Daman for Employment Visa and We are attestation agent. Chennai, Kanchipuram, Tiruvannamalai, Dharmapuri, Erode, Nilgiris, Ooty, Namakkal, Perambalur, Viluppuram, Puducherry, Cuddalore, Ariyalur, Tiruhchirappalli, Karur, Trichy, Dindigul, Theni, Madurai for Dubai, Abu Dhabi, Sharjah attestation. 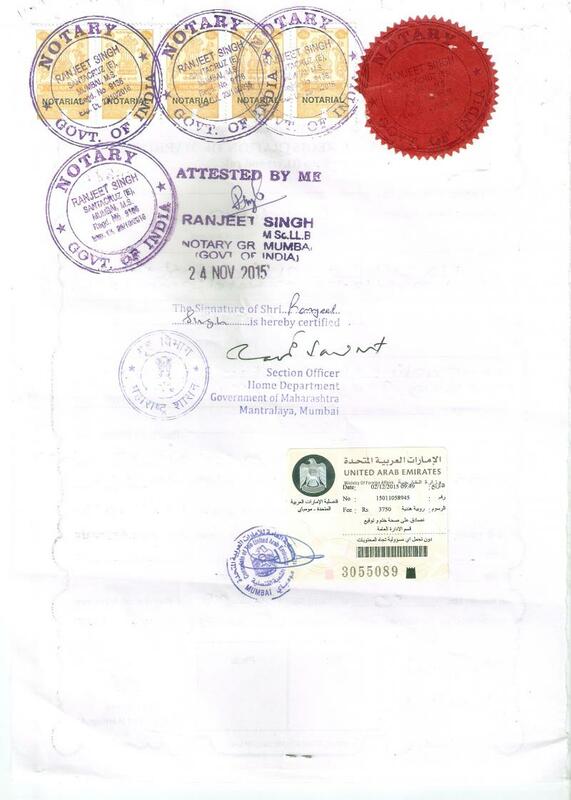 Degree Certificate attestation/ Birth certificate attestation/ Marriage certificate attestation for UAE from Pimpale, Nilakh, Chakan, Danori, Sangavi, Balewadi, Dopodi for Dubai, Abu Dhabi, Sharjah attestation. Degree Certificate attestation/ Birth certificate attestation/ Marriage certificate attestation in Pune Kalas, Lohagaon, Baner, Aundh, Khadki, Yerawada, Viman Nagar, Kharadi, Raj Bhavan, Pashan, Sutarvadi, Tanajivadi, Kalyani Nagar, Shivajinagar, Mundhava, Bavdhan, Hadapsar, Swargate, Wanavadi, Mohamadwadi, Kondhave, Katraj, Wadagaon, Dhanakvadi for Dubai attestation/ Sharjah attestation/ Abu Dhabi attestation. Degree Certificate/ Birth Certificate/ Marriage Certificate attestation for UAE in Vashi, Sanpada, Juinagar, Nerul, Seawood, Belapur, CBD, kharghar, Manasarovar, CST, Masjid, Sandhurst Road, Dockyard Road, Reay Road, Cotton green, Sewri, Vadala Road, GTB Nagar, Chunabhatti, Kings Circle﻿, Thane, Airoli, Rabale, Ghansoli, Koparkhairne, Turbe, Sanpada for Dubai attestation. Degree Certificate/ Birth Certificate/ Marriage Certificate/ Leaving Certificate attestation for UAE in Vidyavihar, Ghatkoper, Vikhroli, KanjurMarg, Bhandup, Nahur, Mulund, Thane, Kalva, Mumbra, Kausa, Diva Junction, Koper, Dombivali Thakurli, Kalyan, Vithalwadi, Ulhas Nagar, Ambernath, Badlapur, Vangani, Shelu, Neral, Bhivpuri Road, Karjat, Palasdhari, Kelavli, Dolavli, Lowjee, Khopoli﻿﻿ for Dunai attestation. Degree Certificate/ Birth Certificate/ Marriage Certificate attestation for UAE from Churchgate, Marine Lines, Charni Road, Grant Road, Mumbai Central, Mahalakshmi, Lower Parel, Elphinstone Road, Dadar, Matunga Road, Mahim Junction, Bandra, Khar Road, Santa Cruz, Vile Parle﻿, Andheri, Jogeshwari, Goregaon, Malad, Kandivali, Borivali, Dahisar, Mira Road, Bhayander, Naigaon, Vasai Road, Nalla Sopara, Virar, Vaitarana, Saphale, Kelva Road, Palghar, Umroli Road, Boisar, Vangaon, Dhanufor Dubai / Sarjah/ Abu Dhabi attestation. Degree Certificate/ Birth Certificate/ Marriage Certificate attestation for UAE from Nagpur, Nasik, Aurangabad, jalgao, Nandurbar, Dhule, Jalna, Beed, Nanded, Usmanabad, buldhana, Akola, Parbhani, Latur, Yavatmal, Washim, Gadchiroli, Solapur, Ahmednagar, Wardha, Gondia, Chandrapur, Ichalkaranji, Sangli, Ratnagiri for Dubai Embassy attestation. 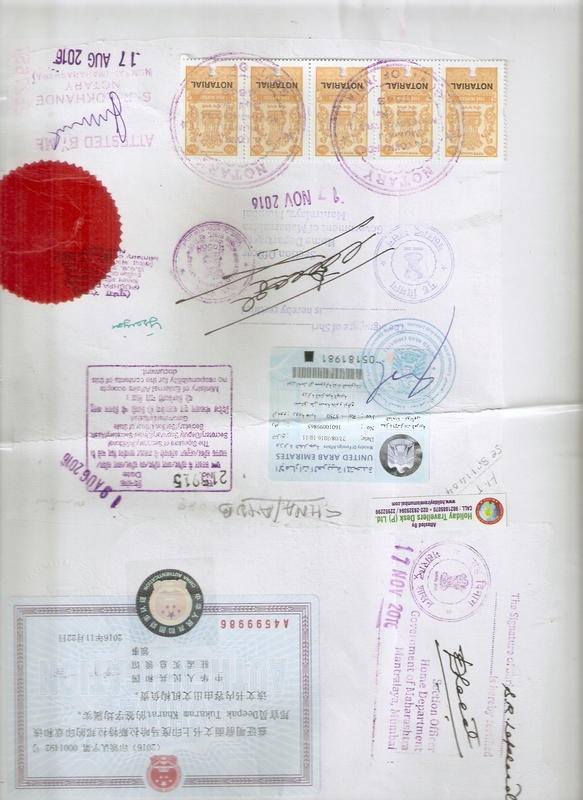 Degree Certificate/ Birth Certificate/ Death Certificate/ Leaving Certificate/ Marriage Certificate attestation for UAE from Mangao, Khed, Chiplun, Mahad, Dapoli, Sangmeshwar, Ratnagiri, Vilavade, Rajapur Road, Vaibhavwadi Road, Kankaval, Sindhudurg, Kudal, Sawantwadi Road, Pernem, Thivim, Karmali, Madgaon, Dapoli﻿ for Dubai attestation.